Wanna go to Indonesia, but don’t know where to start? If you are looking for an easy, yet interesting option, go to Bali. It’s an awesome place (I didn’t like it at first though), where you don’t have to be an experienced traveler to travel on your own without getting lost. However if you are up to something a bit more adventurous, here is our 2-week Singapore – Java – Bali itinerary. Following in our footsteps in 2 weeks you’ll see a bit of ultra modern Singapore and chaos of Jakarta, Indonesia’s capital. You’ll visit the world’s largest Buddhist temple – Borobudur. You’ll see some very beautiful waterfalls, beaches and rice paddies. And you’ll climb 2 of Indonesia’s most beautiful volcanoes. Sounds like a good plan? If the answer is yes – then just keep reading! Why are we including Singapore in this trip? Because Singapore is a very small place. And as a such it may not be worth a separate visit for some. Especially if you aren’t into cities. And it’s there, a short flight away from Java and Jakarta. So why not include it? If you have been to Singapore or simply aren’t interested into modern cities you may as well skip it and fly to Jakarta directly. Otherwise I would highly recommend you to visit Singapore at least for a day or two. Java at the same time is a rather big island. With a population of over 140 million it’s the world’s most populous island. And it’s also a rather well connected island. You can travel by train, bus and plane there. We chose to travel by train and that’s also what I’m gonna recommend to you. Because this way you’ll both have a comfortable journey and you’ll also have a chance to catch a glimpse of the island, not only few of its largest cities. Our route was as following: Singapore – Jakarta – Yogyakarta – Borobudur – Yogyakarta – Probolinggo – Bromo – Ijen – Ketapang – Bali (Ubud). For the first leg of the trip we chose to fly. Because it’s easier and we had only 2 weeks of time. Another option would be to take a boat from Singapore to Batam. It’s a short and quick ride. And then take a ferry from Batam to Jakarta, which is a bit more complicated. As ferries aren’t going every day. And it’s an aproximately 24-hour long journey to get from Batam to Jakarta. If you are feeling adventurous and you have enough time, this might a good option for you. Here you can check routes and schedules of Indonesian ferries. Note that because of the weather they may change at the very last minute as well. Costs: around 33 EUR / 41 USD. Once in Jakarta, I went to the central train station – Gambir Train Station, and bought ourselves train tickets: Jakarta – Yogyakarta and Yogyakarta – Probolinggo. If you are buying a train ticket for another day not today you should be doing it from the ticket vending machine located outside the main building. It’s only in Indonesian. But most probably there will be someone who will be able to help you out. If there is no one, you can always use Google Translate. It’s a very simple process. You need to pay with cash there. Always do this in advance. Because train tickets do sell out. Another option – probably even better – is to buy train tickets online from tiket.com. It’s a reputable company, that I have used myself several times. In Indonesia trains have 3 classes – Economy, Business and Executive. All of them are very OK (much better than trains in India). And all of them have air conditioner. Costs: 350 000 IDR, which is around 20 EUR / 24 USD. As we were planning to visit world famous Borobudur temple at sunrise, we chose to stay very close to it. So there is no need to travel for an hour or more at night. That’s why right after our arrival to Yogyakarta we hailed “a taxi” using app called Grab. Grab is like Asia’s Uber. Another option would be to take a public bus from Jombor bus terminal. If you are 4 or more people it’s cheaper to get Grab. Costs: 128 000 IDR, which is around 7 EUR / 9 USD. To get back from Borobudur to Yogyakarta we took Grab again. And from Yogyakarta to Probolinggo we traveled by train. We had bought tickets already in Jakarta. You an also buy train tickets online from tiket.com. It’s a reputable company, that I have used myself several times. But do it in advance! Costs: 235 000 IDR, which is around 13 EUR / 16 USD. As we were 8 people we knew it will be much more convenient and only slightly (if at all) more expensive to get a private car than to try and use public transportation and taxis. We found a tour company organizing trips to Bromo and Ijen, and we booked a whole trip. Private van from Probolinggo to Bromo, Ijen and afterwards to Ketapang port. 2 nights accommodation (breakfast included). A private jeep to mount Bromo. Mount Bromo and Ijen entrance fees. A guide at mount Ijen. Which is basically everything except for lunch and dinner during these days (it’s a 3 days 2 nights tour). Costs: 1 250 000 IDR per person (8 persons; might be more if you are a smaller group), which is around 70 EUR / 87 USD. There are frequent ferries traveling between Ketapang (Java) and Gilimanuk (Bali), 24 hours a day. As we were planning to go to Ubud and we were 6 people, we chose taxi. If you are traveling solo or you are a couple, you can also take a local bus from Gilimanuk to Denpasar. And then take a taxi, Grab, Uber or GoJek to wherever you need. A local bus costs 70 000 IDR or 4 EUR / 5 USD. Costs: ferry cost us less than 1 EUR / USD. Taxi – 500 000 IDR (car; 6 persons), which is around 28 EUR / 35 USD. Thanks to my friend Harijs, who helped us to plan this trip across Java! Check out his blog here (it’s only in Latvian though). TRAVEL INSURANCE: For travelers to Southeast Asia we recommend World Nomads Explorer! Day 1 – Flight to Singapore. Day 2 – Arriving in Singapore. If you are arriving in the afternoon or in the evening, but still can make it to the area of Marina Bay Sands before 8 – 9 PM, do it. At 8 PM there is a free world-class fountain show in front of Marina Bay Sands. It’s a 15-minute long show, after which you can go for another free light show, on the other side of Marina Bay Sands, in Gardens by the Bay park. That one happens daily at 7:45 PM and 8:45 PM. If you can make it only to one of these, go for Marina Bay Sands show. There is another one at 9 PM. Afterwards or before this you can go for a stroll around the Singapore Central Business District. Wanna have a look on Singapore from above? 1 Altitude Bar is a great option. Pricey, though, and you should dress appropriately to be allowed in, but worth it. Gardens by the Bay. Cloud Dome and Flower Dome. Visiting Chinatown for some wandering around, and having a lunch at the world’s cheapest Michelin-star restaurant – Liao Fan Hong Kong Soya Sauce Chicken Rice Noodle. If you don’t want to eat rice or noodles, go to the nearby Chinatown Food Street and you’ll definitely find something for yourself. Some more skyscrapers and impressive buildings at Orchard Road. If you go to the Orchard Road don’t miss out on famous ice cream in sandwich bread. You’ll definitely notice at least a few vendors selling it. Our favorite – mint ice cream with choco chips. After sunset going for a walk to Marina Barrage (near Marina Bay Sands) to have a nice panorama of the city for free. Another option would be to go to Sentosa island relax on the beach or have fun in one of Sentosa’s many attractions. Getting from Jakarta airport to city can take up to 3 hours depending on the mode of transportation you choose. Fastest and most convenient option is the airport train, launched at the very end of 2017. Train ride takes only around 50 minutes. Visiting Istiqlal Mosque, one of the world’s largest mosques. To be allowed inside you need to dress appropriately. Entrance is for free and you’ll be given a guided tour around the mosque for free, too. Donations are expected at the end of the tour. It’s up to you to choose how much you want to donate. There is no pressure from anyone. Visiting Taman Mini Indonesia park on the outskirts of Jakarta. It’s a pretty big park. I recommend you to take a cable car ride first to get a glimpse of the place you have arrived to. Later you can decide what is that that you are interested to see. Many of museums in the park look run-down. What we liked the most was all these traditional Indonesian houses from differents parts of the country. Most of them are located in one part of the park. Bicycles and tandem bicycles (2 – 3 – 4 person) are available for rent. Easiest way for getting to the park is by train and Grab or Uber taxi. See some more Jakarta travel tips + things to do in Jakarta. Spending biggest part of the day traveling to Borobudur. Although the distance from the Yogyakarta train station to Borobudur is only about 35 kilometers, it can take up to 2 hours of traveling by car. Day 7 – Borobudur and Yogyakarta. Leaving the guest house at 4 AM to go for sunrise at Borobudur temple. Transportation and tickets have been arranged at the guest house the night before. Afterwards going for a walk around the area. If you have time and you like small villages and rural areas, going to Borobudur you can choose and stay in the village for a day or two as well. There are several guest houses and also few hotels. It’s a very peaceful and nice local area without fancy restaurants, supermarkets and no any tourists in sight. 99% of tourists coming to Borobudur leave straight away. Wandering around Yogyakarta in the late afternoon / evening. And again… spending best half of the day traveling by train from Yogyakarta to Probolinggo. Going out for a short walk in the evening. Day 9 – Probolinggo and Bromo. Leaving guest house in the evening and heading for Madakaripura waterfall before going to Bromo (by private minivan). That’s the same waterfall you can see a small part of in the previous photo. Definitely worth a visit. Arriving to a guest house close to mount Bromo. Day 10 – Bromo and Ijen. Leaving guest house at 3:30 AM to go for sunrise at mount Bromo. Why so early? Doesn’t make any sense, if you ask me, because it’s a short ride to get to Bromo sunrise point and sunrise is only a few hours later. But that’s how everyone is doing there and our guide insisted on it. Afterwards going to climb the crater of mount Bromo. Heading back to guest house to have a breakfast. Spending about 6-8 hours in a minivan traveling to mount Ijen. Arriving to a guest house late in the evening. Day 11 – Ijen and Bali. Starting a day at 1 AM and heading to mount Ijen. Climbing to the crater of mount Ijen (it’s another impressive volcano). It’s a steep path going up, but it’s a path, so you don’t need any special climbing equipment, only comfortable shoes. Afterwards going down into the crater. Watching sunrise from the top of crater and returning back to the starting point. Having a take-away breakfast from our hotel and heading for Ketapang port. Leaving for Bali on a ferry. Day 12, 13, 14, 15 – Bali. One thing you should definitely know is that getting around in Bali takes A LOT of time. 30 kilometers (50 miles) is about 1 hour of driving, if the traffic is OK. Going to Green Bowl and Bias Tugas beaches. Visiting Gugung Kawi temple and Monkey Forest. Exploring Tukad Cepung and Air Terjun Tibumana waterfalls. Driving a lot both on very busy and also very interesting roads (like the one going from Ubud to Munduk). Visiting Taman Bali (abandoned theme park). If you have time and the weather is good definitely try and go for a sunrise at Pura Lempuyang Luhur temple in far East of Bali. Day 16 – flying back home. From all these places Singapore is the most pricey one. Bali on the other hand is the place where you get the best bang for your buck. Overall accommodation-wise Indonesia is a very affordable destination. Price: Double room starts at 26 EUR. Check the latest price and reviews: Booking.com. A decent hostel only few kilometers away from the area of Marina Bay Sands, close to the nearest metro station. In the area there are a lot of restaurants and bars. Both private rooms and bunk beds are available. Even with the private room you’ll have to use shared bathroom and toilet. Free toiletries are available. Or check out all the best hotels and hostels in Singapore on Booking.com! Price: Double room starts at 16 EUR. An affordable 2-star hotel 3 kilometers away from the central train station. All of the rooms are equipped with an air conditioner, a desk, TV, wardrobe and safe. All rooms come with a private bathroom. Laundry service is available at surcharge. Or check out all the best hotels and hostels in Jakarta on Booking.com! Price: Double room starts at 9 EUR. A family owned homestay in a local neighborhood. There are only 3 rooms. So if you are group of people, you may as well book the whole place. Lunch and dinner can be ordered but you may not have a choice, which is still very convenient, because there aren’t any dining options nearby. Rooms are simple, yet clean and it feels good to stay there. Or check out all the best hotels and hostels in Borobudur on Booking.com! Price: Double room starts at 15 EUR. A stylish and affordable hotel close to the city center. It’s a big hotel, yet it feels very cosy there. Rooms are bright colored and equipped with an air conditioner. There is a TV in every room. Free drinking water is available for the guests. Downstairs there is a pretty big chillout area. Breakfast may not be included in the price (you have to choose). Or check out all the best hotels and hostels in Yogyakarta on Booking.com! Price: Double room starts at 12 EUR. A simple and very popular homestay in the particular area. Probolinggo is an average-sized town where there aren’t too many accommodation options, but where you definitely can find a someone who will help you to visit mount Bromo and Ijen. So if you haven’t yet figured this part out, here you can get it done. Rooms are simple, but very clean. There is an on-site restaurant and bar. Or check out all the best hotels and hostels in Probolinggo on Booking.com! Price: Double room starts at 21 EUR. A very nice, small hotel a short walk away from the city center. 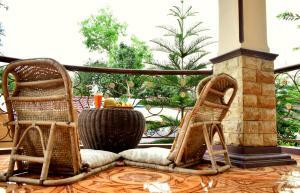 Hotel is on a small and quiet road, away from the hustle and bustle of Ubud. All rooms in Gora House Bali are equipped with an air conditioner. Rooms are rather big, bright and very clean. Beds – long and wide. There is no TV in the room. Hotel has a small pool. Or check out all the best hotels and hostels in Ubud, Bali, on Booking.com! Do you have any questions about over-landing from Jakarta to Bali? Or maybe about Singapore? Ask in the comments or reach out to us on Facebook! If you are from Latvia, check out our travel blog in Latvian – Latvieši Ceļo!